Being Frugal and Making It Work: FREE 8x10 Collage Print at Walgreens - Makes the Perfect Gift! FREE 8x10 Collage Print at Walgreens - Makes the Perfect Gift! 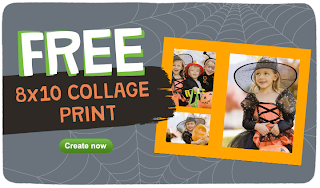 Now through November 2nd, you can get a FREE 8x10 Collage Print at Walgreens! Just use coupon code BOOCOLLAGE at checkout! This would make the perfect frugal Christmas gift. Simply put it in a frame and viola! Be sure to choose in-store pickup and your total out of pocket cost will be $0! **Coupon code BOOCOLLAGE is only valid for 1 use per Walgreens.com account thru November 2nd, 2013. Code must be entered at time of checkout to apply discount. Offer limited to one free 8x10 collage print. Shipping costs may apply on online orders if in-store pickup is not available in your area.